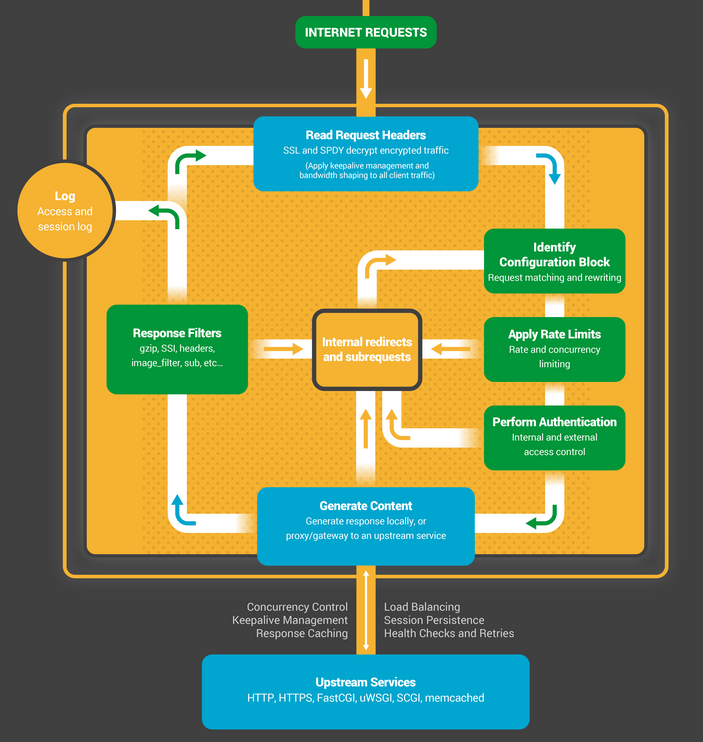 The Inside NGINX infographic drills down from the high-level process architecture to illustrate how NGINX handles multiple connections within a single process. This blog explains how it all works in further detail. To better understand this design, you need to understand how NGINX runs. NGINX has a master process (which performs the privileged operations such as reading configuration and binding to ports) and a number of worker and helper processes. On this 4-core server, the NGINX master process creates 4 worker processes and a couple of cache helper processes which manage the on-disk content cache. They can use more compute cores at the same time. Threads and processes make it very easy to do operations in parallel (for example, to handle multiple connections at the same time). Processes and threads consume resources. They each use memory and other OS resources, and they need to be swapped on and off the cores (an operation called a context switch). Most modern servers can handle hundreds of small, active threads or processes simultaneously, but performance degrades seriously once memory is exhausted or when high I/O load causes a large volume of context switches. The common way to design network applications is to assign a thread or process to each connection. This architecture is simple and easy to implement, but it does not scale when the application needs to handle thousands of simultaneous connections. 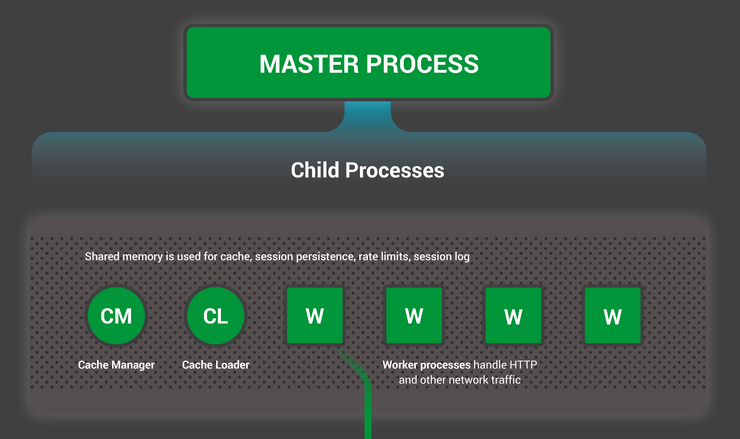 The master process performs the privileged operations such as reading configuration and binding to ports, and then creates a small number of child processes (the next three types). The cache loader process runs at startup to load the disk-based cache into memory, and then exits. It is scheduled conservatively, so its resource demands are low. The cache manager process runs periodically and prunes entries from the disk caches to keep them within the configured sizes. The worker processes do all of the work! They handle network connections, read and write content to disk, and communicate with upstream servers. When an NGINX server is active, only the worker processes are busy. Each worker process handles multiple connections in a non-blocking fashion, reducing the number of context switches. Each worker process is single-threaded and runs independently, grabbing new connections and processing them. The processes can communicate using shared memory for shared cache data, session persistence data, and other shared resources. 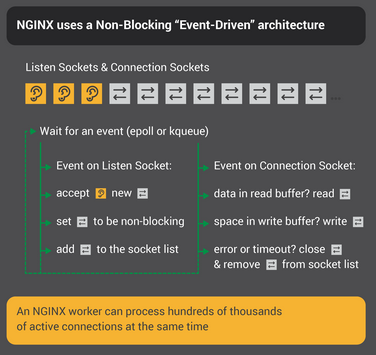 Each NGINX worker process is initialized with the NGINX configuration and is provided with a set of listen sockets by the master process. The NGINX worker processes begin by waiting for events on the listen sockets (accept_mutex and kernel socket sharding). Events are initiated by new incoming connections. These connections are assigned to a state machine – the HTTP state machine is the most commonly used, but NGINX also implements state machines for stream (raw TCP) traffic and for a number of mail protocols (SMTP, IMAP, and POP3). The state machine is essentially the set of instructions that tell NGINX how to process a request. Most web servers that perform the same functions as NGINX use a similar state machine – the difference lies in the implementation. Think of the state machine like the rules for chess. Each HTTP transaction is a chess game. On one side of the chessboard is the web server – a grandmaster who can make decisions very quickly. On the other side is the remote client – the web browser that is accessing the site or application over a relatively slow network. However, the rules of the game can be very complicated. For example, the web server might need to communicate with other parties (proxying to an upstream application) or talk to an authentication server. Third-party modules in the web server can even extend the rules of the game. Recall our description of a process or thread as a self-contained set of instructions that the operating system can schedule to run on a CPU core. Most web servers and web applications use a process-per-connection orthread-per-connection model to play the chess game. Each process or thread contains the instructions to play one game through to the end. During the time the process is run by the server, it spends most of its time ‘blocked’ – waiting for the client to complete its next move. The web server process listens for new connections (new games initiated by clients) on the listen sockets. When it gets a new game, it plays that game, blocking after each move to wait for the client’s response. Once the game completes, the web server process might wait to see if the client wants to start a new game (this corresponds to a keepalive connection). If the connection is closed (the client goes away or a timeout occurs), the web server process returns to listening for new games. The important point to remember is that every active HTTP connection (every chess game) requires a dedicated process or thread (a grandmaster). This architecture is simple and easy to extend with third-party modules (‘new rules’). However, there’s a huge imbalance: the rather lightweight HTTP connection, represented by a file descriptor and a small amount of memory, maps to a separate thread or process, a very heavyweight operating system object. It’s a programming convenience, but it’s massively wasteful. Perhaps you’ve heard of simultaneous exhibition games, where one chess grandmaster plays dozens of opponents at the same time? Kiril Georgiev played 360 people simultaneously in Sofia, Bulgaria. His final score was 284 wins, 70 draws and 6 losses. That’s how an NGINX worker process plays “chess.” Each worker (remember – there’s usually one worker for each CPU core) is a grandmaster that can play hundreds (in fact, hundreds of thousands) of games simultaneously. The worker waits for events on the listen and connection sockets. An event on the listen socket means that a client has started a new chess game. The worker creates a new connection socket. An event on a connection socket means that the client has made a new move. The worker responds promptly. 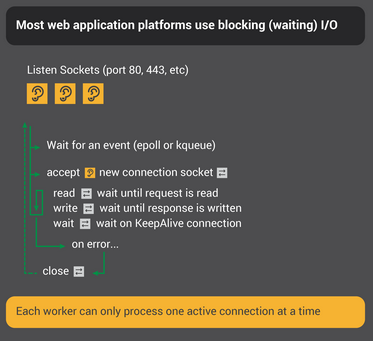 A worker never blocks on network traffic, waiting for its “opponent” (the client) to respond. When it has made its move, the worker immediately proceeds to other games where moves are waiting to be processed, or welcomes new players in the door. Why Is This Faster than a Blocking, Multi-Process Architecture? For a more detailed explanation, check out this article about NGINX architecture, by Andrew Alexeev, VP of Corporate Development and Co-Founder at NGINX, Inc.
With appropriate system tuning, NGINX can scale to handle hundreds of thousands of concurrent HTTP connections per worker process, and can absorb traffic spikes (an influx of new games) without missing a beat. NGINX’s process architecture, with a small number of worker processes, makes for very efficient updating of the configuration and even the NGINX binary itself. command, which checks the configuration on disk and sends the master process a SIGHUP signal. Reloads the configuration and forks a new set of worker processes. These new worker processes immediately begin accepting connections and processing traffic (using the new configuration settings). Signals the old worker processes to gracefully exit. The worker processes stop accepting new connections. As soon as each current HTTP request completes, the worker process cleanly shuts down the connection (that is, there are no lingering keepalives). Once all connections are closed, the worker processes exit. This reload process can cause a small spike in CPU and memory usage, but it’s generally imperceptible compared to the resource load from active connections. You can reload the configuration multiple times per second (and many NGINX users do exactly that). Very rarely, issues arise when there are many generations of NGINX worker processes waiting for connections to close, but even those are quickly resolved. NGINX’s binary upgrade process achieves the holy grail of high-availability – you can upgrade the software on the fly, without any dropped connections, downtime, or interruption in service. The binary upgrade process is similar in approach to the graceful reload of configuration. A new NGINX master process runs in parallel with the original master process, and they share the listening sockets. Both processes are active, and their respective worker processes handle traffic. You can then signal the old master and its workers to gracefully exit. The entire process is described in more detail in Controlling NGINX. The Inside NGINX infographic provides a high-level overview of how NGINX functions, but behind this simple explanation is over ten years of innovation and optimization that enable NGINX to deliver the best possible performance on a wide range of hardware while maintaining the security and reliability that modern web applications require. [转]How does the Go runtime work? The Go runtime is a Go package, which appears (in the documentation, the build process, the things it exports) to be like any other Go package. It is written in a combination of Go, C, and assembly. In order for it to do all the low level things it needs to do, there are special adaptations (hacks?) in the build system and in the compiler that are activated when compiling it. The runtime has architecture- and OS-specific things in it, which are compiled in according the the target platform. When your program does things that could cause a crash, like a cast, or accessing an item in an array, the compiler emits calls into the runtime, which checks the data type with run time type info, or checks the bounds of the array. Likewise for memory allocation and for creating new goroutines, the runtime gets control. The runtime has a user-space scheduler in it, which implements cooperative multitasking; if a goroutine goes into a tight loop without calling any routines that would block (thereby giving the scheduler control) it can starve all the other goroutines. The runtime spawns a new system thread when needed to prevent the system from blocking on system calls. There can be fewer system threads in a Go system than the number of goroutines that are active. When programming Go, the runtime is not in the front of your mind. You interact with the system library, and the runtime supports your code more or less silently. This is why the majority of information you’ll see about Go is how to use the libraries and how to use the channels to implement concurrent programming, and little about the runtime itself.